The EUR/USD is consolidating above Friday lows as markets take a breather after last week’s large pullback in the Euro. We notice the EUR/GBP and gold are hunkering within their trading ranges as well, implying investors are waiting for further fundamental data before making a more definitive directional decision. The EU will release its ZEW Economic Sentiment data tomorrow along with UK CPI and an Inflation Letter from the BoE. Furthermore, we’ve got a slew of important data from the U.S and China on Wednesday. Hence, activity could really pick up as the week progresses and we could witness a break in the EUR/USD from the comfort of its trading range. That being said, although the EUR/USD has had a downward inclination lately, the currency pair has managed to bottom above 1/8 lows and our 2nd tier uptrend line. Therefore, the EUR/USD has the potential to pop back into its uptrend should upcoming fundamentals support the risk trade. On the other hand, the EUR/USD is presently hovering close to some key technical supports. Therefore, the currency pair could take another sizable step down should technicals deteriorate further. Technically speaking, the EUR/USD has bottomed nicely above 1/8 lows and our 2nd tier uptrend line. Hence, although the uptrend is presently in a weak state it’s still in play. That being said, the EUR/USD has our 1st and 2nd tier uptrend lines serving as technical cushions along with December ’09 lows should they be tested. Our 1st tier uptrend line runs through January lows. Hence, a failure of our 1st tier could yield a more protracted leg down. As for the topside, the EUR/USD faces multiple downtrend lines along with 1/7, 1/5, and 1/14 highs. Furthermore, the psychological 1.45 level could serve as a technical obstacle should it be tested. The Cable is trading off of intraday highs after setting new January highs. The Cable continues to hold strong technically after the Pound outperformed last week amid positive UK data flows. However, the Cable has remained within the confines of our trend lines as we notice range-bound behavior in the EUR/USD and gold as well. This behavior tells us that investors are still having a directional debate due to the negatively mixed U.S. economic data so far this month. However, activity should heat up as the weak progresses. The earnings season will kick into first gear and we’ve got a slew of economic data on deck. The UK will release CPI data along with the BoE’s Inflation Letter. The BoE seems intent on using inflation as a barometer guiding its monetary policy. Therefore, a larger than expected increase in prices could boost the Cable as investors speculate a more hawkish monetary stance from the BoE. On the other hand, sluggish pricing data could take some of the wind out of the Pound’s sails and test the resilience of our uptrend lines. Additionally, the U.S. will release PPI and Building Permits data on Wednesday followed by China’s GDP and Industrial Production numbers during Thursday’s Asia trading session. Hence, volatility could really pick up as the week wears on. Technically speaking, we recognize the Cable’s trend lines are approaching inflection points, a signal that heightened volatility could be approaching. Meanwhile, the Cable is still trading above 1/04 and 1/15 lows with multiple uptrend lines serving as technical cushions. As for the topside, the Cable faces multiple downtrend lines along with intraday and 12/16 highs. Our 4th tier downtrend line runs through December ’09 highs. Therefore, an eclipse of our 4th tier could yield a more sizable leg up. The USD/JPY is consolidating above Friday lows as we recognize consolidating patterns across the FX market. The U.S. markets are closed today, meaning volume could be sparse today. However, we have seen volatility pick up on low volume, so investors may want to keep an eye on the markets. Although the USD/JPY’s technicals deteriorated last week, BoJ Governor Shirakawa reiterated the central bank’s intent to fight deflationary pressures. Therefore, it seems the BoJ’s loose monetary policy could be in place for quite some time. Shirakawa’s dovish monetary stance could limit downward movements in the USD/JPY for the near-term. Furthermore, should conditions really deteriorate for the USD/JPY Shirakawa and Kan could become more vocal in defense. On the flipside, should investors make a return to the risk trade the USD/JPY could really benefit since investors are anticipating a loose monetary stance from the BoJ. Meanwhile, activity should pick up in the FX markets with pricing data on the way from the UK and U.S. along with China’s GDP and Industrial Production data during Thursday’s Asia trading session. As a result, investors could have the ammo necessary for making directional commitments, meaning investors should keep a close eye on technicals of the USD/JPY and its correlations as the week wears on. Gold continues to find solace in our 1st tier uptrend line amid weakness. We’ve witnessed 4 consecutive bounces on our 1st tire uptrend line this month as the EUR/USD inches higher. Gold has built a beautiful head and shoulders pattern in the process with key economic data releases on deck. We notice similar anticipation in the EUR/USD and GBP/USD as the currency pairs consolidate with trend lines converging. Hence, it seems the markets could be in for some volatility as the week wears on. The UK and U.S. will release pricing data over the next two sessions and China will highlight the week during Thursday’s Asia trading session with the release of GPD and Industrial Production. That being said, investors shouldn’t get complacent during period of relative inactivity since the markets should heat up soon. Crude futures are bouncing back from Friday lows as investors make use of what appear to be oversold conditions. Meanwhile, the Dollar is weakening across the board with investors preparing for this week’s stream of economic data. The wave of data will begin tomorrow with UK CPI and EU ZEW Economic Sentiment. Both releases are heavily weighted and could have a direct impact on the FX markets. On Wednesday the UK will release key employment data followed by PPI and Building Permits from the U.S. China will highlight the week by printing GDP and Industrial Production on Thursday. That being said, FX Markets should be active and crude’s demand outlook could be influenced by China’s economic data. We notice consolidative patterns in the EUR/USD, GBP/USD and gold while their respective trend lines approach inflection points. Hence, the markets are sending multiple signals that a turning point could be approaching. Therefore, investors should keep a close eye on the market’s reaction to upcoming fundamental releases. Weakness in the Dollar and a return to the risk trade could pop crude back above its psychological $80/bbl level. On the other hand, a retreat to safety in the Dollar could drag crude lower as expected demand from overseas withers. Technically speaking, crude futures are still trading below their highly psychological $80/bbl level, a negative development. The futures currently have our 1st and 2nd tier uptrend lines serving as technical cushions along with 1/15 and 12/4 lows. Furthermore, the psychological $75/bbl level could serve as a solid support should it be tested. As for the topside, crude faces technical obstacles in the form of 1/13 highs and the highly psychological $80/bbl level. U.S. markets are shut today for the MLK holiday. However, the S&P futures are edging higher as the Dollar depreciates slightly and gold bounces along our 1st tier uptrend line. Consolidation in the Dollar and approaching trend line inflection points indicates that the markets could be in for some volatility as the week progresses. Earnings season is kicking off and we have some key economic releases on deck. The U.S. will release TIC Long-Term Purchases tomorrow followed by PPI and Building Permits on Wednesday. The UK will release its CPI tomorrow followed by its Claimant Count Change on Wednesday. Furthermore, China will highlight the week by releasing its GDP and Industrial Production data on Thursday. Hence, the wire is chalk full of key econ data releases, meaning investors may make some directional commitments this week should fundamentals send clear signals. That being said, investors should closely monitor activity in the EUR/USD, GBP/USD and gold for any noteworthy technical breakouts in either direction. Correlations should come into play and the Dollar may lead the way for equities. Technically speaking, the S&P futures are currently trading at an important near-term juncture. 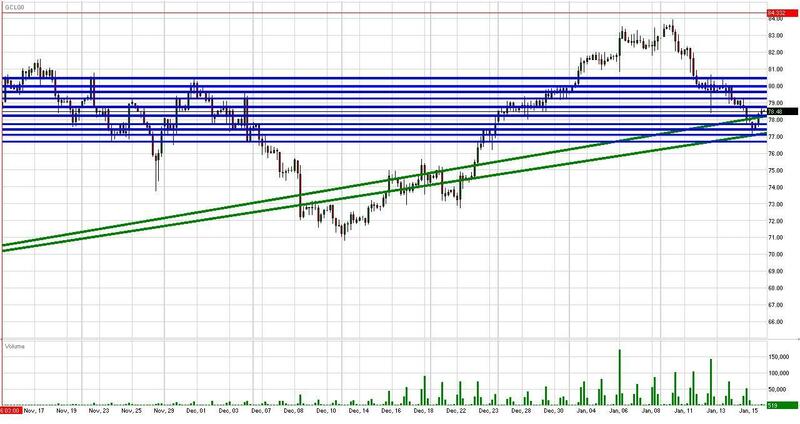 The futures managed to bounce off of our 1st tier uptrend line which runs through December 18 levels. Hence, a collapse of our 1st tier uptrend line could yield a more sizable leg down. As for the topside, the S&P futures face technical barriers in the form of 1/7 and 1/14 highs along with January highs. In the meantime, the S&P futures will attempt to create some breathing room above our 1st tier uptrend line with our 2nd and 3rd tier hanging overhead.